A children’s book for all people. Andrea Yerramilli definitely strikes gold with her first children’s book, Ralphie, Always Loved. If you are looking for a book that will teach your children spirituality through the love of a pet or help them deal with the loss of a family pet, this wonderful piece of children’s literature really delivers. 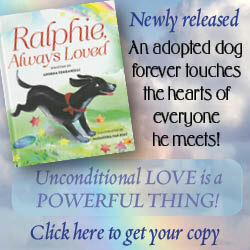 The book begins with Ralphie, the puppy, who is in heaven, playing with the angels while painting clouds. Yerramilli’s use of words when describing his folly include, “He carefully dipped his tail into the paint, WAG, WAG, WAG, swishy little clouds floated across the sky,” “He used his paws next, TAP, TAP, TAP, paw-print clouds dotted the sky,” and finally, “He stuck his nose into the bucket of paint, AAAACHHOOOOO, paint sprayed everywhere!” all are an imaginative example of onomatopoeia, giving the reader, and the listeners — your child or children — a sense of the actual actions and sounds of the character. You can almost see and hear Ralphie just by reading the words. This is a great way to incorporate your child’s senses while listening and also will increase his/her comprehension, as well as increase awareness of using colorful adjectives. Besides giving the reader and listener visual images, Ms. Van Riet’s illustrations are beautiful and bring the characters to life. Ralphie then meets God, who tells Ralphie how much he is loved as He dips His finger into the white paint and paints a heart on Ralphie’s chest. He then tells him that it is time for him to be born. The story continues with Ralphie sadly waiting at the Wonderful Dog Rescue for a family to come along and take him home. He wonders why he is here for the third time. I love how the author has an innate sense to understand and explain what a puppy is thinking and why he does the things he does. For example, Ralphie wonders, “What does “antique” mean, and why can’t I chew it?” She does this throughout the book, which is very engaging to both reader and listener. Soon, more characters are introduced, including a baby boy named Shane and a girl named Marissa. Ralphie, who is confused at first by the changes in the household, soon becomes very protective and falls in love with Shane and Marissa. The book continues to tell the story of the part Ralphie plays in Shane and Marissa’s ideal, storybook childhood. He is there to protect them when they are babies. He is there to see them off to school in the morning, sleeping until they arrive home. He is there to play with them in the backyard until dinner is ready. He is there to kiss them goodnight. It is obvious he is a significant part of this family. Eventually, the torch of sole protector is handed to him when Skipper leaves the family and goes home to God. I love the way the author gently explains the loss of a pet with her skillful use of words! Finally, Ralphie begins to age and the author gently expresses this by effectively describing the fur on Ralphie’s face getting whiter each day in the shape of a heart. She talks about how Ralphie can still do some of the things he used to do, only he is slower and needs to take breaks. When I reached the part about the party the family has for Ralphie’s sixteenth birthday, a lump began to form in my throat. I love how the author describes the party, especially how “pupcakes” were served to Ralphie’s doggie friends. Again, the illustrations are absolutely stunning. As a first grade teacher, I absolutely will be reading this book to my class. I know it will teach them empathy, sympathy, and how to love and deal with the loss of a pet. It will also help them tap into their background knowledge about any pets they may have had that have passed.